Your PBX does not have a separate door interface but you still wish to use a door phone system. Choose the TFS-Dialog 200! 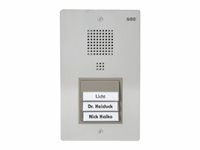 It is connected directly to an analog subscriber port on your system by means of a 2-core cable and behaves just like a telephone: when the doorbell button is pressed, an internal or external phone number is dialed.